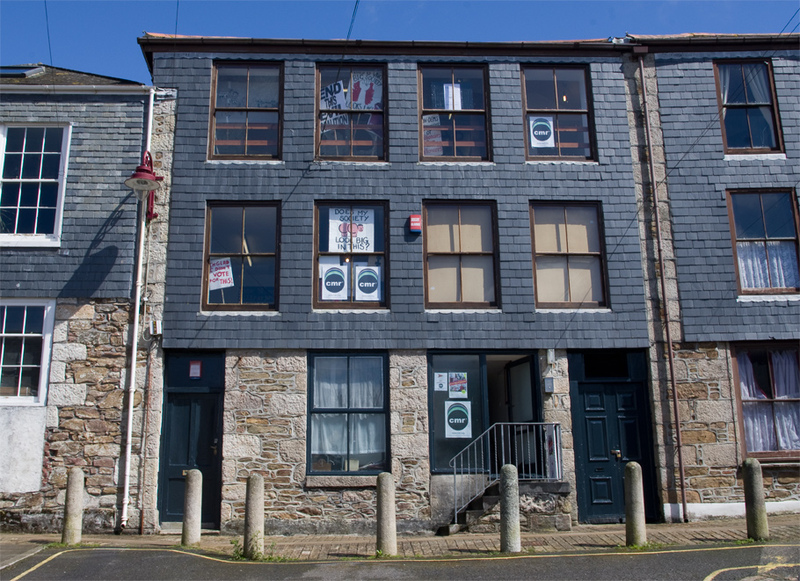 CMR is an artist-led project space, exhibition space and membership initiative based in a spacious three story building in Back Lane West, Redruth, Cornwall. It opened its doors to the public in March 2012. CMR has evolved to be an exhibition and project space for established and emerging artists from within the county as well as nationally and internationally. We aim to encourage adventurous work that will challenge the current expectations of contemporary art in the southwest. Artists, writers and curators are encouraged to discuss and work together, by fielding exhibitions, discussions, social and skill-sharing events and workshops. A significant objective for CMR is to enable contemporary art to be accessible to the immediate community, both as a creative centre and for specific programmed events. The CMR space is ideal for exhibiting contemporary art in all its diversity and could include painting, sculpture, installation, performance, participation, text, digital media, photography, film and sound work. We currently do not support solo exhibitions. CMR consists of an elected group of four Directors and paid Members. It is currently a voluntary-run organisation and project space that has achieved it's growing success through work, commitment and belief in its ideals. The current Directors have a range of experience, including event organisation, PR, exhibition curation, teaching and on-going involvement in artist-led and community projects. They are also practicing artists, specialising in film, writing, installation, sound, graphic design and research. CMR currently does not receive funding and is supported through this voluntary commitment, and the development of the Membership initiative is vital to allow the continuation and growth of the project. CMR is an artist-led project space, exhibition space and membership initiative based in Redruth, Cornwall. CMR aims to provide resources and space for learning and development through networking, screenings, workshops, talks, exhibitions and events. This aims to inspire members within their art practice also creating the potential to work together and network, stage exhibitions, develop projects and ideas and create work that is critically engaged. CMR actively encourages experimental, ambitious and genre defying work that may not easily find a platform within existing regional art venues. It is flexible in its attitude to mixing and crossing forms. This encourages adventurous work and encompasses all art forms - including painting, sculpture, installation, text, digital media, photography, film, sound work, performance, public art & relational practices. CMR aims to make a positive contribution to the socio-cultural ecology of Redruth and the surrounding area. CMR interacts with other projects and communities locally, nationally and internationally to reinvest, encourage and raise the profile of contemporary art within the county. This primarily makes it accessible within the local community but ultimately creates opportunities for all by forming networks further afield. CMR is the relaunch of Cornwall Media Resource, an educational charity established in the late 90s. The organisation was originally called Cornwall Video Resource and began life in a room at County Hall, mainly as a membership organisation. It bought the building in Redruth in the early-mid 90s with the aid of an award from the Foundation for Sport and the Arts (FSA). The new institution was revenue funded by South West Arts (SWA) and employed a full time administrator, but when SWA hived off its film and video side to the newly formed South West Media Development Agency (SWMDA) the funding was removed and the organisation became entirely voluntary and run by the membership, who elected the directors at each AGM. The organisation became a registered charity in the late 1990s and was renamed Cornwall Media Resource, with a new constitution. Around this time there was a big upsurge in video production in Cornwall. Then came the first relatively cheap digital equipment, and the possibility of non-linear editing on PCs. CMR members and directors played leading roles in the formation of the CIA (variously interpreted but most commonly expanded as 'The Cornish Independent Filmmakers Association') that, with the coming of European Regional Development Fund Objective One funding to Cornwall played an important part in the formulation of the Cornwall Film Fund, with a budget of several million pounds. One sad aspect of Objective One was that the temporary existence of funding for Cornish film work accidentally killed off the collective, collaborative ethos that had previously underpinned moving image work here. Along with changes in technology that largely rendered edit suite-based production obsolete, the membership of CMR declined and the building became very little used. Cornwall Media Resource wound down its activities. The old building was rented as offices for a few years, then stood empty for several more. Meetings on the MA Fine Art course at Falmouth Uni in 2011 led to Cornwall Media Resource being rebranded and relaunched as CMR, focussing on developing a programme of exhibitions and events, with contemporary art at it's heart. CMR is new, revitalised, reclaiming the empty building in the heart of Redruth, on the spine of Cornwall. CMR is a gallery, a project space, an organisation and a concept.